Local Promotional Marketing Company Gives Back in Tees | MacKellar Associates, Inc.
More than two-thirds of the poverty increase since 2000 occurred in households located in the suburbs. In fact, suburban poverty now exceeds that of urban areas in absolute numbers and continues to grow at twice the annual rate. And, to make matters worse, suburban communities are ill-prepared to deal with the needs of the poor. 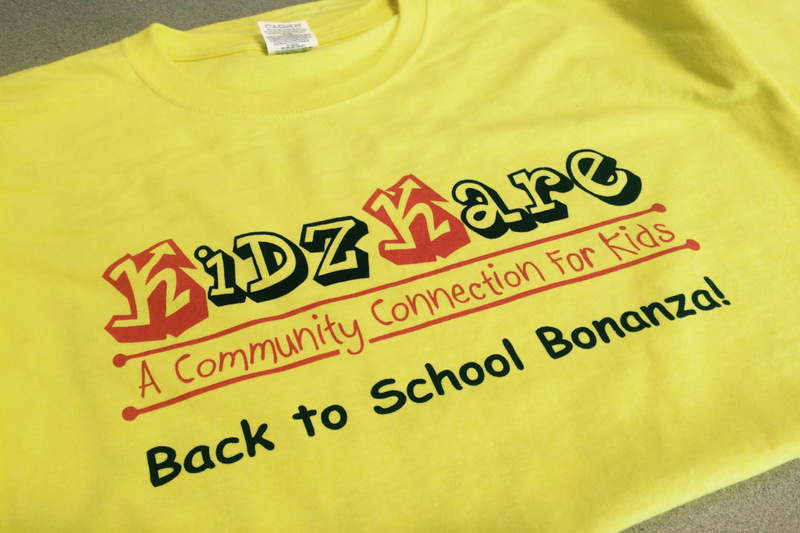 Organized by the nonprofit KidzKare, the Back to School Bonanza! seeks to highlight and address the problem of suburban poverty. The 5th annual health and wellness event will take place on Saturday, August. 27, from 10 a.m. until 2 p.m. at West Middle School in Rochester Hills. The MacKellar Promotional Marketing team, a division of MacKellar Associates, Inc., is hopeful to help bring attention to this neglected problem in the community. “We want to have an impact on the lives of the children within our community,” stated Andrew MacKellar, VP – Operations. “MacKellar will be participating in this unique effort by providing t-shirts for all the KidzKare staff and volunteers.” Other event partners will be providing school supplies, clothing, backpacks and haircuts, as well as well-child exams for daycare, school and sports; dental, vision and hearing screenings; and education on physical, emotional and social health. All goods and services are offered at no charge to Rochester area kids ages 4 to 18 who are on Medicaid and/or underinsured. An effort is made to make the event fun for children, with a variety of entertainment offered including face painting, educational games, music and recreation, as well as healthy snacks and drinks. “Despite our improving economy and our reputation as a wealthy region, the number of families who need this type of support here continues to grow,” says Jay Mitchell, M.D., the pediatrician who founded KidzKare and recently retired from practice to work full-time with KidzKare programs. “More than 15 percent of students in the Rochester Community Schools qualify for some type of state and/or federal financial assistance.” In its first four years, the Back-to-School Bonanza! has provided more than 2,200 children with over $330,000 in donated goods and services. In 2013, the event received the Michigan Department of Community Health’s Hometown Health Award. KidzKare was created to help financially disadvantaged kids in the Rochester area and to provide a model for other suburban communities to develop services for their low-income residents. The mission of KidzKare is to “create, provide and support programs that improve the physical, emotional, social and educational well-being of children and youth in the greater Rochester area.” In addition to Back-to-School Bonanza!, current programs include Raising Rochester, a multi-community garden program with produce donated to children and others in need; and Recycled Reader, the collection and redistribution of gently used books for children. The Back-to-School Bonanza! takes place August 27th at West Middle School, 500 Old Perch Rd. in Rochester Hills. To register, volunteer, exhibit, donate or sponsor, visit www.kidzkare.net or call 248-505-3522. To learn more about MacKellar Associates, Inc., visit www.mackellar.com or call 248-335-4440.